With lower pricing, better performance and fewer pollutants than gasoline, E15 gives retailers a leg up on competitors who have yet to offer the new ethanol blend. Easy on the wallet, easy on the environment, easy on your engine – those are the critical points retailers are underscoring with customers as they persuade them to try E15 fuel for the first time. For retailers, the advantage of introducing consumers to the new ethanol blend is obvious. With lower pricing, better performance and fewer pollutants than gasoline, the new fuel gives retailers a leg up on competitors who have yet to offer the new ethanol blend. But consumer education remains critical. Most retailers find the biggest challenge in marketing the new ethanol fuel is to get motorists to try E15 for the first time. Once convinced to give it a try, customers soon find that the advantages of E15 speak for themselves. Any hesitations among customers when first introduced to E15 nearly always stem from concern over whether the fuel is safe for engines. Yet, E15 is the most widely tested fuel ever to be offered for sale in the U.S. The U.S.
Environmental Protection Agency (EPA) has approved its use in vehicles of model years 2001 and newer, or about 80 percent of vehicles on the road today. E15 also contains fewer pollutants and emits less carbon emissions than regular gasoline. It is cleaner and has higher octane than gasoline – all at a price typically lower than 87-octane fuel. Jim Pirolli, Vice President of Fuels at Kum & Go in West Des Moines, IA, points out that a bit of uncertainty is a natural reaction to new products in the marketplace and one that can be addressed through consumer education. “Those of us in the industry were surprised to find our biggest challenge was getting customers to try E15 for the first time. The biggest focus for us is in trying to inform customers about what E15 is and where it is available, while also reassuring them that this is a safe product, and one they should try,” says Pirolli. Pirolli, who is responsible for the fuel strategy at Kum & Go, including decisions about what fuel products the company is going to carry, says that while 170 of Kum & Go’s 430 stores offer E85, only about seven currently offer E15. But those numbers will soon be rising. 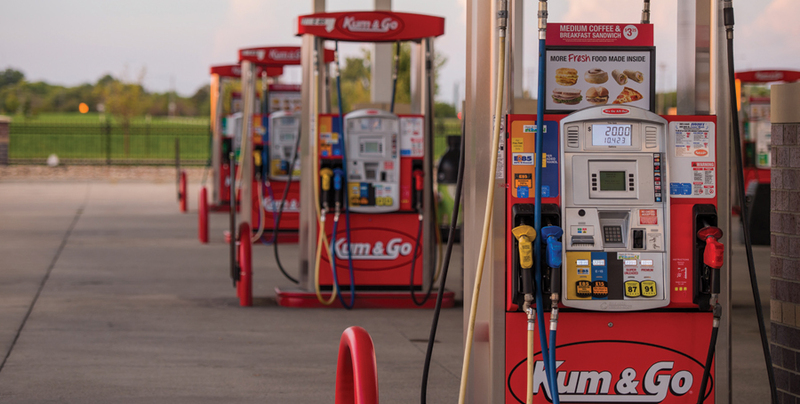 Over the next two years, Kum & Go plans to make E15 available at more than 65 stores across Iowa, Nebraska, Arkansas, Colorado, Missouri, Oklahoma and South Dakota. According to Growth Energy, among all retailers there are roughly 130 locations in 19 states offering E15. In addition, there are another 200 or so retail locations preparing equipment and infrastructure to begin offering E15 in the near future. The increase in E15 availability can have a significant impact beyond the local pump. Moving to E15 would create another 136,000 American jobs on a nationwide basis that can’t be outsourced and eliminate up to 8 million metric tons of greenhouse gas emissions each year. That’s the equivalent of taking 1.68 million vehicles off the road, all while helping consumers save at the pump. The decision to offer E15 is a natural fit for Kum & Go because of the company’s long history of innovations in biofuel offerings, according to Pirolli. The company considers itself a pioneer in ethanol, with a history of environmental sustainability and biofuel innovations dating back to the 1970s. Today, Kum & Go is continuing its focus on biofuels by partnering with several industry organizations, including Growth Energy. Just as they have with locations offering E85, Pirolli says the organization has helped Kum & Go make use of brand ambassadors to promote E15 to customers at special events and train store employees about how to discuss the product’s attributes. Kum & Go’s experience with E15 is not uncommon. Reactions from retailers and their customers have been overwhelmingly positive.